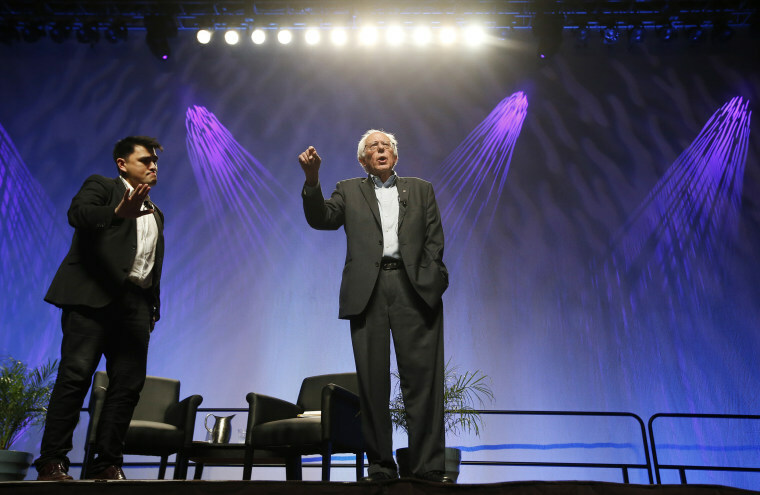 Three years after activists shouted down Bernie Sanders, organizers of the progressive conference say they've worked hard to elevate people of color. NEW ORLEANS — Who will get booed at Netroots Nation this year? But three years after long-simmering racial tensions exploded when Black Lives Matters activists shouted down presidential candidates Bernie Sanders and Martin O'Malley, organizers say they're working hard to elevate people of color, who complain the progressive movement doesn’t always practice what it preaches on race. Netroots stated as a get-together for mostly white lefty insurgents who organized online during the George W. Bush era. But this year, 67 percent of speakers are people of color, including 19 of the 25 keynote speakers, according to organizers. The conference's 90 panel discussions offer more conversations on inclusion. For instance, the description of a conversation on the role of black women, Democrats' most reliable voting block, states that "it is well past the time for progressives to listen to and fight for the specific needs of Black communities." Mary Rickles, the political and communications director for Netroots, acknowledged the issue, but said progress has been made. "There have been intentional efforts to not just increase diversity but make the conference — and movement — more inclusive and intersectional," said Rickles. "It's still a work in progress. Each year we've improved in some areas and realized that we can do better in others." Often compared to conservatives' CPAC confab, Netroots has become the largest annual congregation of the professional left, attracting presidential candidates, vendors and activists who come to pitch themselves and their wares, swap tactics, and meet up with compatriots in other parts of the country. The conference and movement it represents has long lived on the left flank of the Democratic Party, but increasingly moved to occupy its center. This year's speakers include Alexandria Ocasio-Cortez, who recently ousted a long-serving Democratic congressman, and Cynthia Nixon, who is challenging New York Gov. Andrew Cuomo in a September Democratic primary. But its origins in the predominantly white and male liberal blogosphere of the early 2000s — the conference was founded in 2006 as an offshoot of the blog DailyKos — has left it with what some say is a blind spot on race. The tension was evident from the beginning. Jose Antonio Vargas, the reporter who would later become an immigration activist, wrote an article for The Washington Post in 2007 on the lack of diversity at the conference, which he called "the open secret of the netroots." That article first sparked organizers' efforts to change things, Rickles said. More recently, black and brown activists have been demanding more representation in the upper echelons of the Democratic Party and progressive movement more generally, and leveraged the conference to make themselves heard. At last year's conference in Atlanta, protesters chanted “trust black women!” during the entire 10-minute speech of Georgia Democratic gubernatorial candidate Stacey Evans. Evans, who is white, went on to lose the Democratic primary to Stacey Abraham, who is black. The biggest flashpoint, however, came a year earlier, during the heat of the 2016 presidential primary, when Sanders, the darling of left, could barely speak over angry protesters at the lefty conference. “If you don’t want me to be here, that’s OK,” Sanders, visibly annoyed, told the black female hecklers. Sanders is not returning to Netroots this year, leaving the stage to other potential 2020 rivals like Sens. Elizabeth Warren, D-Mass., and Cory Booker, D-N.J., who are both giving keynote speeches. The protesters' primary target was white progressives in general, not just Sanders, but black activists said his focus on class grievances obscured racial problems that couldn’t be fixed with a better social safety net alone. “Our strategy and our intention was very specifically to disrupt the progressive space that Netroots has established and claims to be,” Tia Oso, who helped organize the protest, said at the time. The conference protests, as well as another one shortly after that resulted in a Seattle Sanders rally getting shut down, prompted both Sanders and O’Malley to redouble efforts to heed the demands of black activists. But the disruptions were highly controversial among Netroots attendees, with many worrying it would diminish the conferences’ clout by making presidential candidates and other VIPs want to steer clear of the event in the future. Those fears seem to have proved unfounded. With the left emboldened, this year’s conference features at least a half dozen potential presidential candidates. In addition to liberal favorites like Warren, there are also newcomers like Rep. Tim Ryan, D-Ohio, and Montana Gov. Steve Bullock, along with liberal billionaire Tom Steyer and former Obama housing secretary Julian Castro.